Tropico 5 looks a lot similar to Tropico 4 and Tropico 3 before it. As a Father's Day pressie I managed to nab a copy of Tropico 5 which at first glance seems like a pretty good choice considering my love for the series. I've played every Tropico game (except for Tropico with Pirates aka Tropico 2) and while nothing can beat the novelty and fun of the original, Tropico 3 wasn't too bad and neither was Tropico 4. So I was expecting more of the same choice gameplay in Tropico 5 but with the ability to play multiplayer and through different eras! Most of the gameplay will seem pretty similar to veterans of the series although there are a few new features. For example, now your island nation will progress through different eras such as the Colonial Era, the World Wars Era, Cold War Era and Modern Era. Each of these eras unlock different buildings, edicts and constitution amendments. Wait, you get a constitution now? Yep, so remember how you were able to set things like immigration policy at specific buildings in previous games? You now can do that via the constitution. The only thing is, once you pick certain policies in the constitution you can't change them for several years. So you've got to be careful in what you pick. The game also gives you the ability to create a dynasty - which in game terms means you get multiple El Presidentes that are able to give boosts to buildings and your nation as a whole. There's also the ability to sign a contract and setup trade routes between external powers where you can either import or export a particular number of goods for a better rate. But besides the few things I've mentioned above, the game is pretty much the same. I sadly didn't really get an extensive look into multiplayer (i.e. I didn't really get to try it at all) but there's apparently competitive and co-operative multiplayer modes which sounds pretty good to me. The music is still your fiesta-style Caribbean music and overall it still suits the game although I think the music has been getting progressively worse with each Tropico iteration. Tropico 3 had a more memorable soundtrack when compared to Tropico 4 and in turn, Tropico 4 has a better soundtrack than the latest Tropico game in my humble opinion. Oh and nothing can beat the Daniel Indhart Project on Tropico 1 - that's definitely the best soundtrack in the series. Tropico's black comedy and satire has been a hallmark of the series ever since the first game and Tropico 5 doesn't disappoint. In fact, there are a lot of puns and Dad jokes to enter the mix too, as well as pop culture references, such as when Penultimo talks about his movie script that sounds suspiciously like "Brokeback Mountain". "The boxed retail versions of Tropico 5 using Kalypso Launcher have been hit by a hideous activation bug which prevents the Launcher from starting up properly." Oops. Anyway, for those that are affected by the bug, you can check out the hotfix here. Next time, save yourself the trouble and just get the Steam version ;). In the old Tropico games provided you had the correct prerequisite buildings (such as a power plant) and enough cash, you'd be able to construct the buildings. 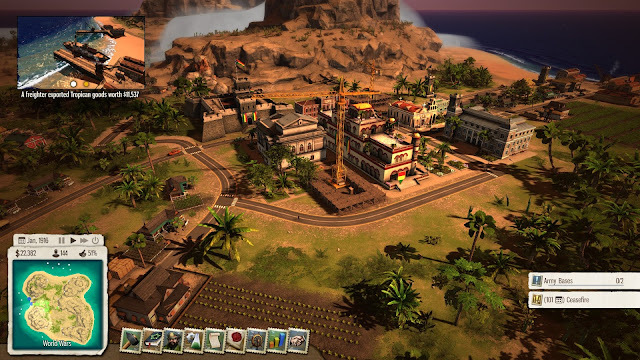 In Tropico 5, this is no longer the case as some buildings you won't be able to access until later eras. It's probably less annoying to new players than it is to veterans since the veterans will have to re-learn how to play the game without the awesome late-game buildings effectively ramping up the difficulty. Consequently, the game starts to feel a lot more linear and there's less freedom in the game in more ways than one; not only does the player have less freedom and options to employ, but the game also suggests that trying to give the people a liberal, democratic government too early is a bad thing. You see, in previous Tropico games I've always strived to give free and open elections to the people and while it was a struggle to keep everyone happy and win the elections, it didn't feel impossible. In Tropico 5 it feels impossible to win an election if you aim for a liberal, secular democracy in the World Wars Era. That's because satisfying the people as a whole seems to take secondary importance to satisfying factions. How this works isn't really properly explained but basically from the games I've played the Militarist and Religious factions are pretty strong in the World Wars era. Consequently, when I don't run my island nation as a patriarchal theocracy that has mandatory military service, these guys get really unhappy and it gets worse over time. Sure, you can placate them somewhat by building a few guard towers and churches but they don't really help much and while there is a summary to indicate why factions hate you so much, it'd be nice if they offered solutions on how to curry favour with them. Also, when you play the main campaign you have to play with a saved island from a previous mission in the campaign; this means when you play a mission (besides the very first mission of course) it will come with all the endemic issues you thought you'd left behind in the previous mission. You basically have to ensure that by the end of each mission you're in a perfect starting point for the next one, which makes the game even more difficult. Tropico 5 feels a lot more linear with gated content compared to previous Tropico games and I found the main campaign definitely more difficult. So much so that after several tries, I found it too frustrating to invest any more time in it. I'd rather just play Tropico 4 since in terms of graphics, audio and humour, it's very similar. Tropico 5 is probably a better game for those who haven't played previous Tropico games or ones that found the Tropico 3 and Tropico 4 too easy. Is the game worth $36? (Current EB Games sale price): If you've never played a Tropico game before and like the idea of a city builder mixed with politics, then yes I think it's worth a punt. Otherwise, if you've already played one of the previous Tropico games, I don't think it's really worth it.